French Onion Dip – from my earliest memories, it’s always been around, whether made from the packet (like my home-made version made with my home-made onion soup mix) or bought at the store. I love love love French Onion Dip. You might call it a guilty pleasure! The promise of this French Onion Dip with Bacon from Cook’s Illustrated (and a few extra caramelized onions from the tart I made last week) prompted further investigation! I mean bacon? C’mon! This dip lives up to the hype! But talk about timing! The Super Bowl is coming up and we’re smack, dab in the middle of winter here in Minnesota – when you’ll see many of us getting together to watch a favorite show, do book club, play games or just hang out. What could be better at a party than chips and dip? Especially if it is a dip that will put all others to shame. Feel free to double or triple this recipe. This dip is best if refrigerated for a while before using, so talk about a perfect for make ahead recipe. I’d be hard-pressed to babysit a pot of onions for a half cup, but I’ve I’ve given directions in the recipe. In the meantime, I’ve learned to cook smarter. I’ll make a big pot and divide the rest up in little bags in the freezer. Here’s three ways to make a larger batch of Caramelized Onions – once you have onions on hand, throwing together a dip like this is a breeze! Excessive stirring makes this dip sticky, but it can be thinned with a little water or more dairy. Use a good, thick sour cream. If you can’t get good sour cream, line a strainer with a paper towel, place over a bowl, add the sour cream and leave in the refrigerator until desired thickness. Fry bacon in small skillet over medium heat until crisp, about 5 minutes, stirring often; remove with slotted spoon to paper towel–lined plate and set aside. When frying bacon, try adding a tablespoon of water to a cold pan, add the bacon, then bring up to heat. This minimizes the possibility of the bacon cooking unevenly and burning. Combine 1/2 cup caramelized onions, cider vinegar, sour cream and bacon in medium bowl. Season to taste with salt and pepper and serve. If time allows, this dip is better after it sits and even better after a day. May be refrigerated in airtight container for up to 3 days. If desired, garnish with green onion and a few bacon bits. Slice though bacon while frozen, then return to freezer. This entry was posted in Click here for Fabulous Food Posts and tagged Appetizer, Bacon, Caramelized Onion, Cook's Illustrated, French, Green Onion, onion dip, onions, Sour cream, Spreads and Dips, Vinegar, Yogurt. Bookmark the permalink. Elaine, it’s really creamy, dreamy and delicious! You might be familiar with the old recipe of using a packet of Lipton Onion Soup mix with a carton of sour cream? Gosh, no, don’t know that one?! I know of French onion soup of course, just not the Lipton version..
French onion is a favourite flavour! 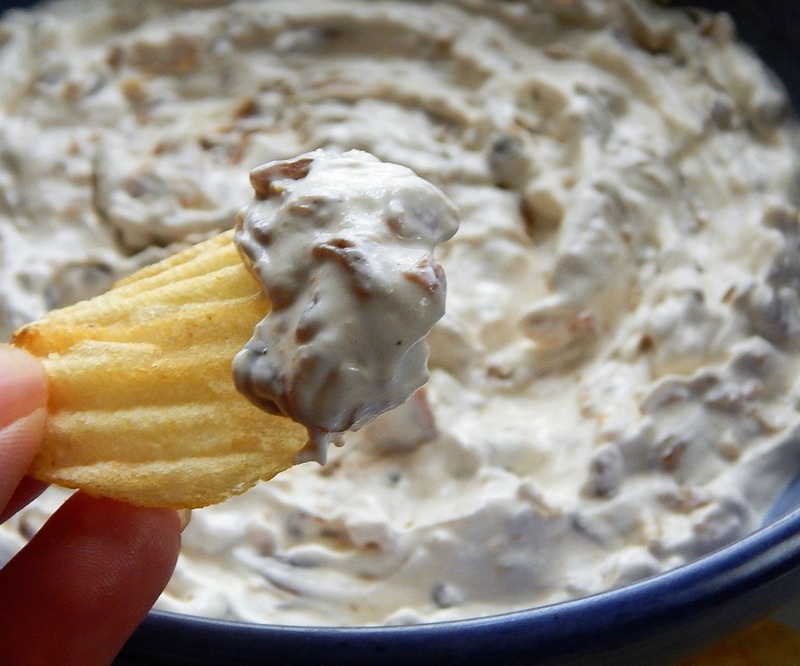 Oh yes, French Onion Dip made an appearance at every party at our house! This dip sounds so delicious. I was brought up on the packet for french onion dip which I loved, but caramelized onion would add so much more depth. Don’t laugh, but I remember when I was young and I made the dip with the Lipton’s packet I thought the recipe was too complicated because it was supposed to SIT for awhile before you ate it! As far as punch of flavor, I think the Lipton’s has a ton of it, but maybe it’s more of the beefy base type of flavor. The Cook’s is just creamy and decadent and more mellow, if that makes sense. I’ve been putting off making a batch of caramelized onions … I have 5 huge Spanish onions and since my Thursday workshop was cancelled, I have time to make it this week. I still have a smidge of mine left! Who knows what the future holds…I may try to eek out one more recipe from the batch! You’re right, you’d have to have plain chips I think for this dip! Did you get your big snow or was the weather ok? The snow missed us on Sunday but we’ve got 1-3 inches predicted for Thursday. The workshop I was going to go to on that day was cancelled so I can stay in and cook and watch my dvds and read and just relax. Both the dips sound delicious, by the way. You could eat them with veggie sticks too, I think. Love that you gave two versions and the healthy version does sound wonderful but give me the bacon. I know, right! I try to avoid it – and chips, too, but bacon is just so GOOD! My son was here to help me out with the eating of this – he left to hang out with friends, and I’m afraid when he came back and asked, “Where’s the dip?” there was NONE left!